Arrive Delhi, meet assist at the airport & transfer to hotel. Overnight stay in Hotel. After a leisurely breakfast sightseeing Full day tour of New Delhi where you Visit the 11th century Qutab Minar, India Gate and The President' s House, Red fort, Mahatama Gandhi Memorial. Also visit Laxmi Narayan temple popularly known as Birla Temple. Overnight stay in Hotel. After Breakfast pick up from hotel drive to Agra on the way stop at ikandra and in early afternoon visit Agra the magnificient Taj Mahal - one of the seven wonders of the world surely the most extravagant expression of love. Also visit the Agra fort the rusty and majestic red-sandstone fort of Agra stands on the banks of the river Yamuna and over Overnight stay in Hotel. 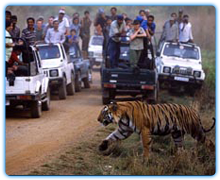 After Breakfast in the Morning drive to Ranthambore-famous for the wildlife sanctuary enroute visiting Fatehpur Sikri-a perfectly preserved red sandstone ghost town which was the estranged capital of Mughal emperor Akbar Arrive Ranthambore & transfer to hotel. Overnight stay in Hotel. After Early morning breakfast do a Jungle safari in a Canter (a vehicle which is open on the top) enjoy the game viewing in the national park and back to the hotel. After lunch second visit to jungle and enjoy the game viewing again. Overnight stay in Hotel. After Breakfast drive to jaipur and Transfer to the Hotel and . In the Afternoon Visit to Birla temple, Nahargarh Fort (sunset view over city). Dinner at an Ethnic Rajasthani Village Resort over night at Jaipur. After Breakfast in the morning do a fullday tour of jaipur . Drive through the Johari Bazaar, or the old jewelers market to Hawa Mahal (Palace of Winds). Visit the various museums inside the City Palace and the ancient observatory, Jantar Mantar. Also visit Gaitor (royal cenotaphs), Amber Palace, Jaigarh Fort and Kanak Vrindavan Temple. Evening free.. Overnight stay in Hotel. After Breakfast drive to Udaipur - an oasis in the desert state of Rajasthan enroute visiting the famous pushkar Brahma temple. Continue drive to Udaipur. Arrive and transfer to hotel. Night stay in Udaipur. After Breakfast city sight seeing tour of Udaipur. After Breakfast 09:45 Visit Vintage Car Collection, the guided tour of City Palace, then visit Durbar Hall, Crystal Gallery. 13:30 Lunch at Savage Garden restaurant. 14:45 walk up to the Clock tower; visit Sheetal Nath Jain Temple and Jagdish Temple. 16:00 Lake boat ride to Jag Mandir Island. 17:45 shopping or visit to Bagore-ki-Haveli. 19:00 Dharaohar cultural show. Walk from Gangaur Ghat along Pipli Ghat and over footbridge. 20:30 dinner at Lake Pichola. Overnight stay in Hotel.